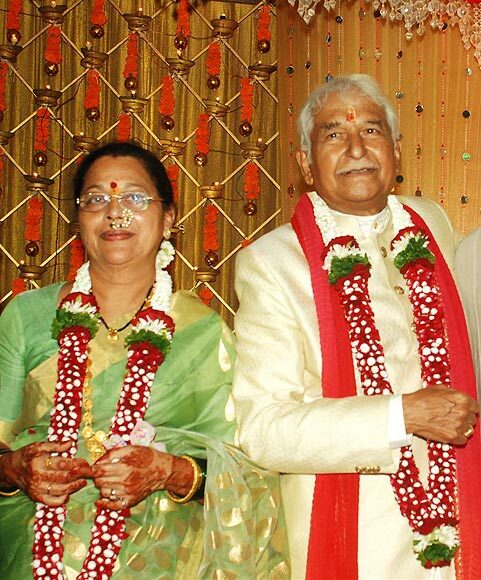 Yesteryear actors Ramesh and Seema Deo celebrated their 50th wedding anniversary by exchanging their vows once again, at the ISKCON temple, in Juhu, a western suburb of Mumbai. 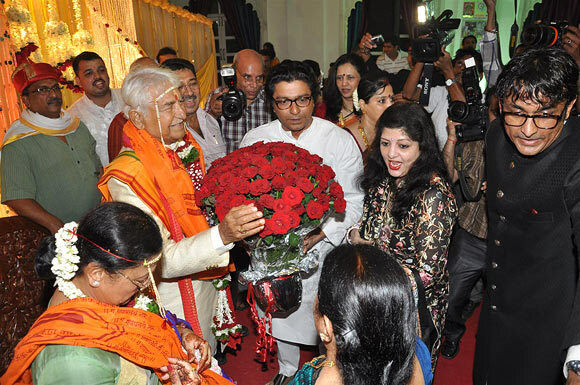 Quite a few film personalities from the Hindi and Marathi film industry showed up, as did their politician friends. 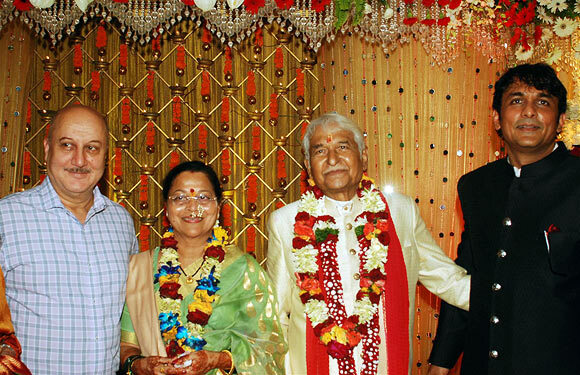 Click Next to see more pictures of the wedding anniversary celebrations. 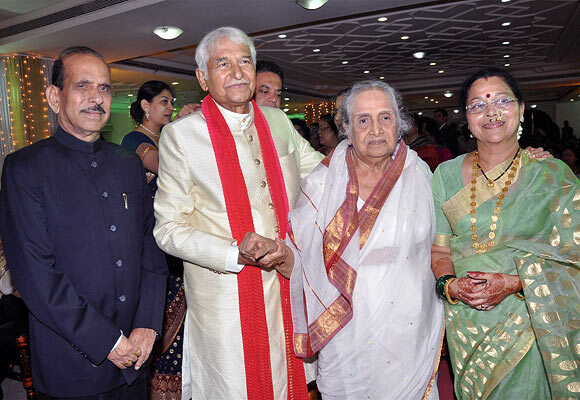 Ramesh Deo and Seema have acted together in quite a few Hindi movies like Dus Lakh (1966), Saraswati Chandra (1968), Anand (1970), Koshish (1972), Kora Kagaz (1974), Rani Aur Lalpari (1975), Yehi Hai Zindagi (1977), Dada (1979), Hathkadi (1982) and Janam Janam (1988). They have acted in Marathi films like Jagachya Pathivar (1960), Vardakshina (1962), Goshta Lagnanantarchi (2010) and Jetaa (2010) as well. Their younger son Abhinav (pictured here) has directed films like Game and Delhi Belly. 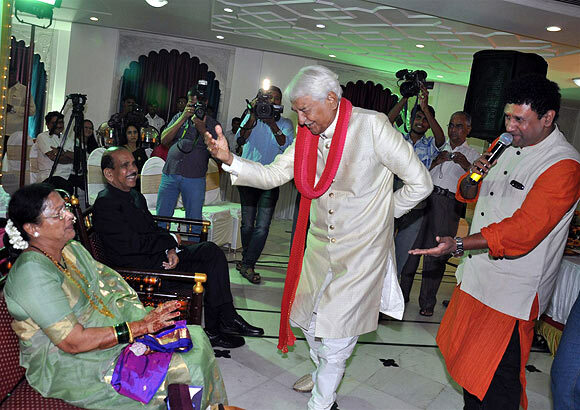 Later, Ramesh Deo danced in front of his 'bride,' while politician Manohar Joshi (in black) enjoyed the show. 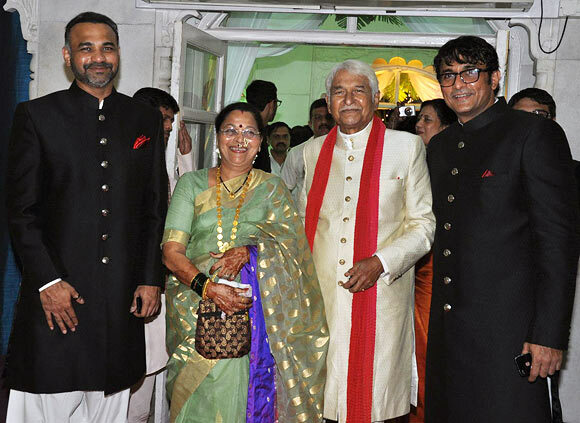 Ramesh and Seema Deo pose with their sons, Abhinay and Ajinkya. The latter is a popular Marathi film actor. Quite a few stars were spotted at the reception. Anil Kapoor arrived with wife Sunita. Seema Deo had played his mother in Roop Ki Rani Choron Ka Raja and Jamai Raja. The latter film starred Hema Malini as well. 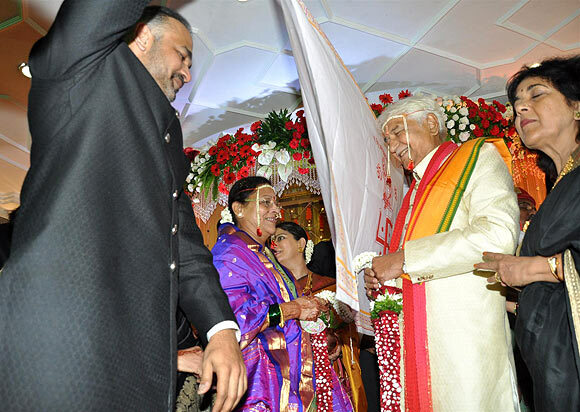 Hema Malini has also worked with Ramesh Deo in Kasauti. 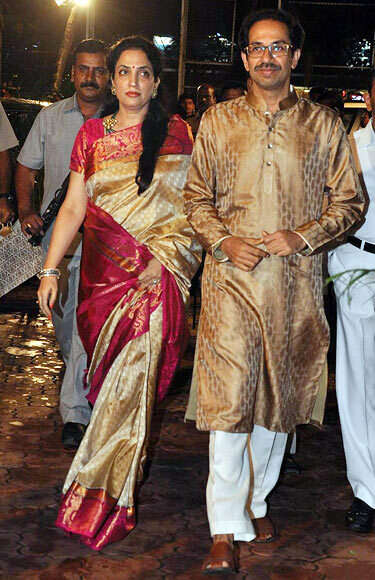 Shiv Sena chief Uddhav Thackeray arrives with wife Rashmi. 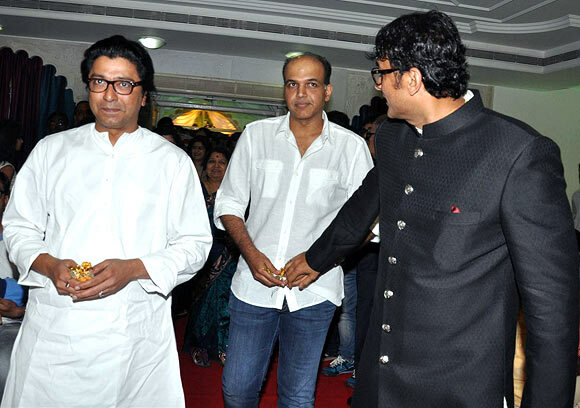 His cousin and MNS chief Raj Thackeray was also spotted at the do, with wife Sharmila. 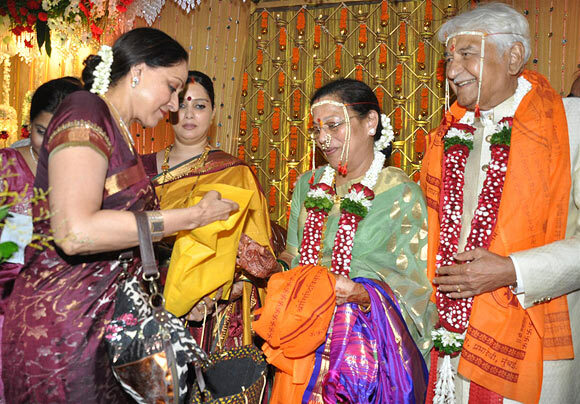 Hema Malini, whose younger daughter Ahana got engaged recently, gives a present to the couple. Ajinkya Deo ushers in Raj Thackeray and director Ashutosh Gowariker. 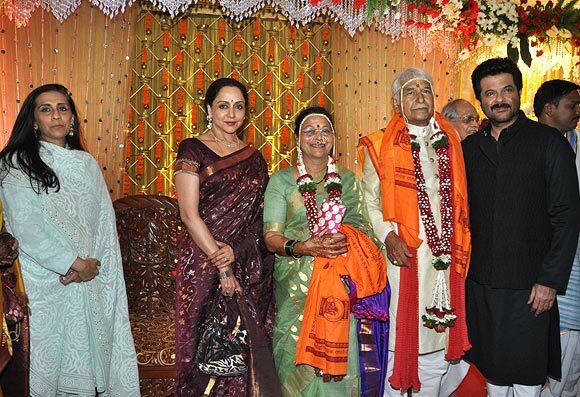 Politician Manohar Joshi and yesteryear actress Sulochana pose with the couple. Anupam Kher, with Ramesh, Seema and Ajinkya. Jackie Shroff, who plays Seema Deo's son in Roop Ki Rani Choron Ka Raja, poses with the couple. 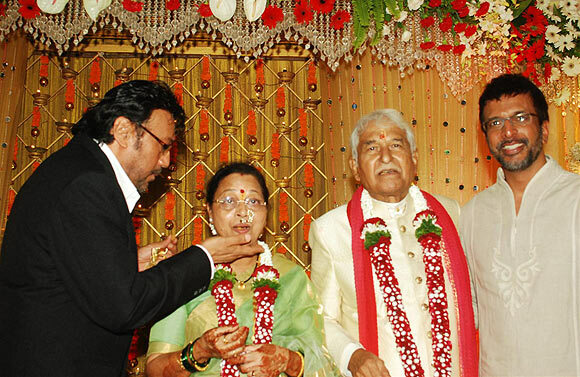 Jaaved Jaafferi also wished the happy couple. 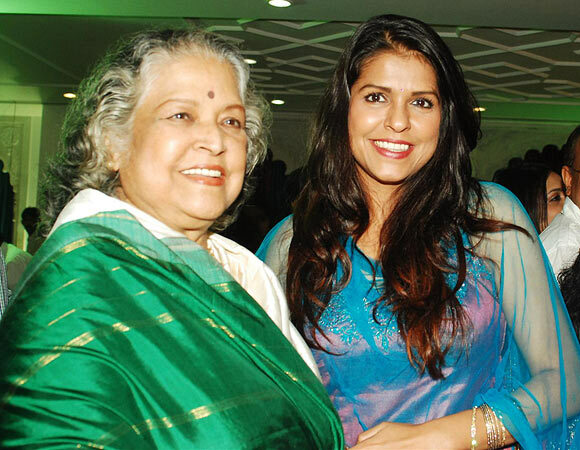 Yesteryear actress Shobha Khote arrived with her actress daughter Bhavna Balsaver. 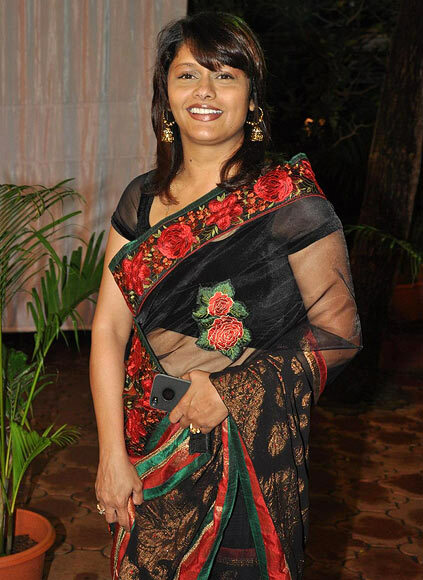 Pallavi Joshi had worked with the Deos in the 1979 film, Dada. 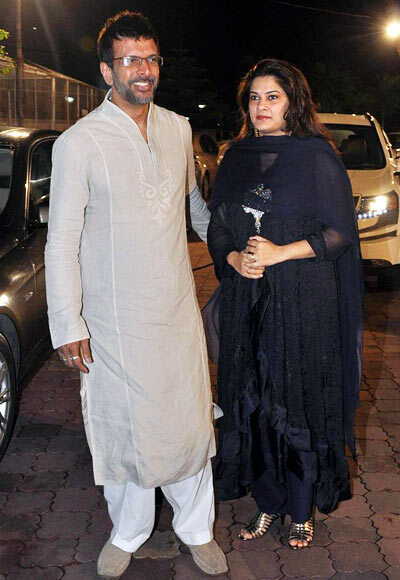 Jaaved Jaaferi was accompanied by his wife Habiba. 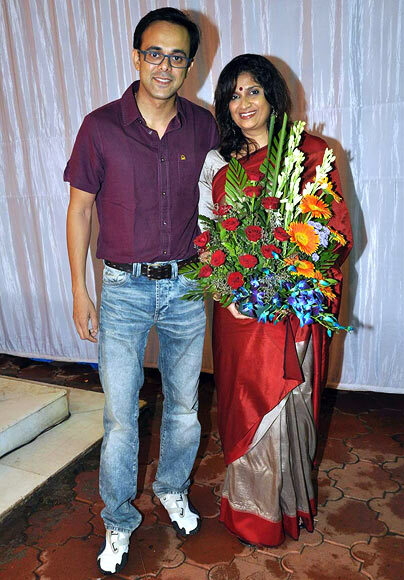 Television actor Sumeet Raghavan arrived with his wife Chinmayee. MORE PIX: Dharmendra-Hema's daughter Ahana gets engaged!